Footage was shot by Mick Kalber, Tropical Visions Video, at 6:30 on Thursday, Dec. 15, 2016. Paradise Helicopters crew with Tropical Visions Video photographer/videographer Mick Kalber conducted a volcano flyover at 6 a.m. on Thursday, Dec. 15. The new offshoot from the 61g flow has continued slowly towards the east, and is turning slightly to the south and now well over a mile from the vent. 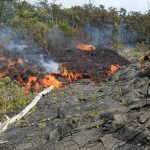 The main flow continues unabated, dumping tons of lava into the Pacific Ocean at Kamokuna just inside Hawai’i Volcanoes National Park. 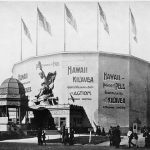 “Pele sends her flows through the tube system from the vent some six miles to the new lava delta, which continues to make the Big Island bigger, minute by minute, day by day,” Kalber added. Several recent skylights are still located at the bottom of the Pali surrounded by loose crumbling lava, which can be dangerous, as collapses can occur without notice. Lava can be seen inside the glowing tubes as it rushes toward the Pacific Ocean. Heavy flows into the water frequently explode as the cool sea water is not able to cool them off quickly enough, and the resulting steam sends lava rocks skyward. Numerous lobes of lava are pouring into the Pacific Ocean there, creating a huge plume of laze that can be seen for many miles. The walk is lengthy, however, and precautions should be observed. Hawaiian Volcano Observatory cautions visitors viewing the 61g flow ocean entry (where lava meets the sea), that there are additional significant hazards besides walking on uneven surfaces and around unstable, extremely steep sea cliffs.Venturing too close to an ocean entry exposes you to flying debris created by the explosive interaction between lava and water. Also, the new land created is unstable because it is built on unconsolidated lava fragments and sand. This loose material can easily be eroded away by surf, causing the new land to become unsupported and slide into the sea. In several instances, such collapses, once started, have also incorporated parts of the older sea cliff. Venturing too close to an ocean entry exposes you to flying debris created by the explosive interaction between lava and water. 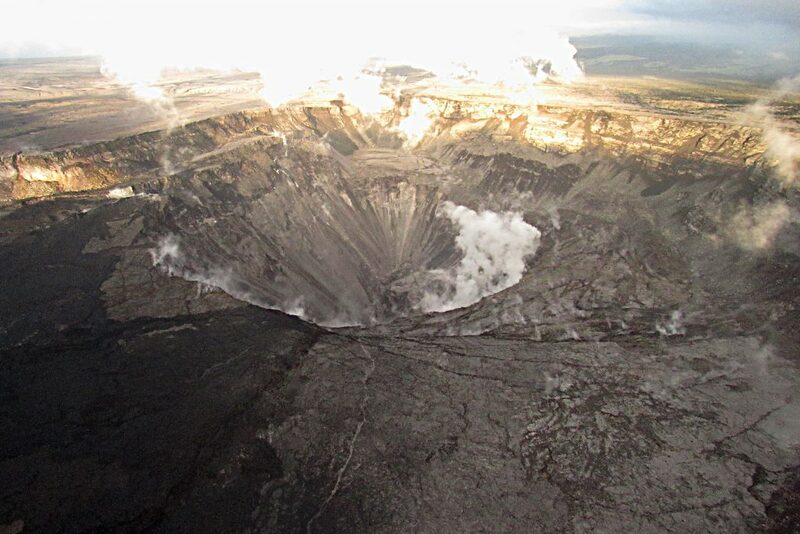 Also, the new land created is unstable because it is built on unconsolidated lava fragments and sand. This loose material can easily be eroded away by surf, causing the new land to become unsupported and slide into the sea. In several instances, such collapses, once started, have also incorporated parts of the older sea cliff. Finally, the interaction of lava with the ocean creates a corrosive seawater plume laden with hydrochloric acid and fine volcanic particles that can irritate the skin, eyes and lungs.